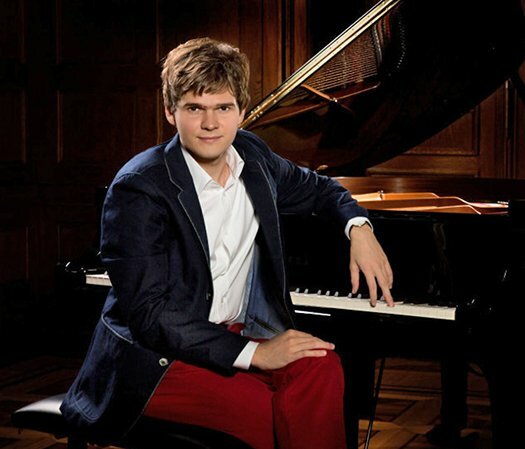 I don’t believe I’ve ever heard a young pianist in concert whose sound and initial attacks were as lovely and rounded as that of the Pole Artur Haftman. Maybe only Murray Perahia 40-plus years ago was as ear-opening. Sonically, Haftman’s recital Friday night in the Foundation for the Chinese Performing Arts 26th Annual Music Festival at Walnut Hill stands as a piano high point of the last few years, but it was top-drawer in many other aspects as well. The program opened with Mozart briskly showing off joking spirits and busy fingers (K.281) and Polish composer Karol Szymanowski being both virtuosic and studious in his young Variations in B-flat Minor, richly chromatic like a lesser Brahms working a cocktail lounge in Eastern Europe two century turns ago. It was the uniquely gentle lightness of the Liszt Hungarian Rhapsody No. 6 that focused my attention on Haftman’s touch. I spent much time wondering if he strikes the keys and then instantly pulls back just a bit, or the other way round, pausing very slightly at the strike and then instantly pressing hard. A bootless attempt at analysis of his nonexistent hardness. The pianist did find droll gestures in the Liszt, maintained elegance where the octaves get brutal, and ended with a great show of force. But execution in a few spots was not fully at the modern post-competition level, and there are dozens of peers whose playing of this staple is technically superior. I would rather hear what Haftman thinks. The rest of the program was Chopin. Lots of Chopin. I’m not the only reviewer who dreads this sort of thing. Aggravating Chopin’s often inherent impatience and unearned pearliness are the banging and unsimple approaches favored by so many 20-something Chopin wannabe-specialists. But from the first four Mazurkas and a Waltz to the Berceuse, a Ballade, and a Polonaise, all anchored in the middle by the Piano Sonata No. 2, I have never heard the like, and I would sit again and again through an all-Chopin recital from Artur Haftman. Pleasure was constant. No wincing, no flinching. Each piece was as if from a different composer. Different rubatos were featured, though all emerged unobtrusively whether the musician was rippling along or ripping along. The relaxation and shapeliness of phrasing sounded various, dramatic moment to dramatic moment. Every other minute a newly uncovered voice or line could be overheard. The Mazurkas danced wistfully, and were truly danceable, not the way most play them. The Valse tenderly wowed; the Berceuse lulled. That tired Polonaise in A-flat Major had never been heard before, it turned out. And the overexposed Sonata not only had zero clang anywhere but the Scherzo’s timbre sang bel canto before a Funeral March that was so sad and moving as to produce the most morose fear I’ve ever felt in a piano recital. The Finale must be a crazed flurry, and was, here less manic than usual. Surely there are qualifications. Well, some might want more fire and bite than this, and for sure most have heard it roared forth instead of these kind strokes. Some might have found the Walnut Hill recital sonically a little too even, too much of the same sound, although be assured that Haftman interprets with many colors and dynamic gradations. He does need to work on lifting the damper pedal; more than one ending cadence got smeared. Splendid, no affectation, no stupid rubber arm thing going on…. The attack: no ambiguity. And he’s actually playing the broken chords as written. So many people play them too closed in the beginning and too splayed later. And the little rubatos: just right. My teacher used to tell me that Chopin wrote all the smarmy into it, so I could just park all mine at the door and we’d get along fine. It’s rare to be able to relax into Chopin. I’m sitting here gobsmacked by this kid. Went back to hear Rubinstein to restore my belief in the power of maturity. I can see how some years of what we old folks call Life might add to to this boy, but dear Jesus! Can we get [hot local star] to study with him? Haftman makes some of it almost too easy. Thanks for these. Rich time listening. Permit a word about this local summertime chamber music festival which, adjudged only in terms of performance excellence, has become Rockport South, or should. The rolling Walnut Hill School campus, while bereft of harbor views, makes a pretty stroll. Natick is way easier to get to than the North Shore for us western suburbanites. But this festival is lightly attended! And then chiefly by a large proportion of summer students and family and friends. All its venues are perfectly acceptable acoustically. It’s beyond inexpensive ($5 suggested). And more and more, the modestly redoubtable Cathy Chan’s festival features performances exceptional by any measure. (Of the four upcoming piano recitals over the next two weeks—and there is much more than that—one is to be given by a young pianist who played one of the best Chopin Preludes performances I’ve heard.) I strongly urge all music-lovers to check it out. Ed. Note: Reference to Valentina Lisitsa corrected. I am very proud to say that Artur Haftman is one of the musicians of my charity Talent Unlimited (Reg. No 1139220). This is a British charity helping and mentoring young musicians of great talent. Artur never ceases to amaze me with his musicality and future potential. I look forward to seeing him command an important place on the international stage. Hopefully it was having been in thrall to Haftman’s sonic production, but in seeking reference standards for similarly rounded attack, I somehow conflated Valentina Lisitsa, who is not Polish but Ukrainian, and Krystian Zimerman, who of course is Polish. Przepraszam. Fixed above.